Unfortunately, many would attest that one will probably never be able to easily procure "real" Japanese food outside of Japan, but of course many have opposed to this. Conclusively, a smart restaurateur must cater to the local tastes at least a little in order to stay in business. So how can we now enjoy real Japanese cuisine, one that originated from Japan. Since the time being, eating Japanese food is not an adventure anymore. It's a culture that was well accepted in our country and Japanese food-lovers don't seem to fantasize anymore of getting a visa just to savor authentic Japanese cuisine. In this blog alone I have quite a number of accounts of our Japanese encounter. 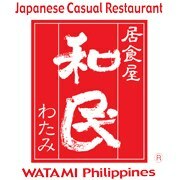 Watami, the number one casual restaurant in Japan, has opened its doors to Makati foodies, with its branch in Glorietta. And what better way to welcome their diners. 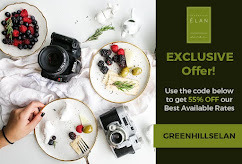 They have put up a promo-a new lunch set menu, to whet the appetite of office workers and diners alike looking for an experience of the authentic taste of Japan at the convenience of their hectic schedules. With another branch at Mall of Asia, this intimate Japanese haven was perfectly set in the newly renovated part of Glorietta. Just a stone-throw away from hotels such as Holiday Inn, Fairmont, and Raffles. I was blessed enough to try Watami’s Glorietta branch. Lunch time was brimming with diners as everyone (including me) were enjoying the restaurant's modern yet homey ambiance, with low-key lighting and booth-style seating. The Zen-vibe is eminent with wood panels and contrasting distressed tiles, which brings a calming background for busy days, and are the perfect backdrop for a respite from work, catching up with friends, or sharing a meal with family. Now, let's check on the lunch offering. The lunch set menus start at P275, and are served with salad and miso soup. 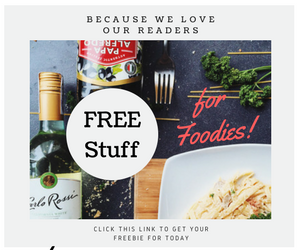 With options that cater to a wide array of gastronomes, from raw foodies to noodle nibblers to rice lovers. The lunch menu features Watami’s signature Stone Pots, which are one-bowl wonders of Black Pepper Beef, Pork, or Beef Sukiyaki served in heated pots that not only keep the meal warm, but also cooks the meat to your liking. If raw keeps you filled, there are options for tuna or salmon sashimi rice sets, served with your choice of mini cold or hot udon to complement the meal. For me, Japanese food is all about fresh, succulent and colorful array of ingredients artfully-arranged on platter or bowl. It's all about savory ramen, and raw fish (and seafood) of finest quality. So, what else would I befell to? I got myself one of their lunch set, Salmon Sashimi Rice Set (P 395). 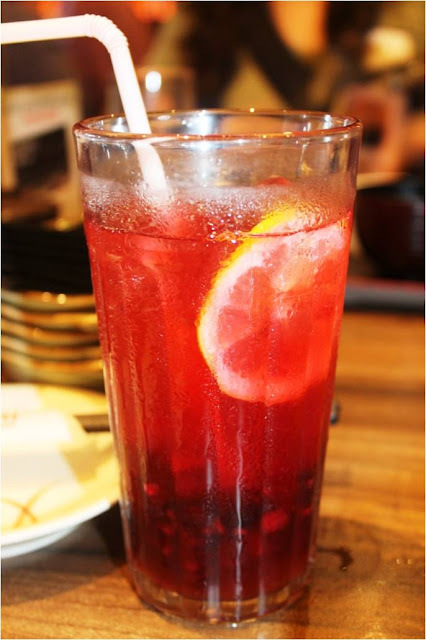 My lunch went down my tummy with this glass of thirst-quenching, zesty Apple Berry Soda (P 195). I love the fresh berries sunk at the bottom, though it overpowered the taste of apple. My seatmate, the Editor of kristn.com, had the Tuna Sashimi Rice Set (P 395). Her beverage was the Green Citrus Tea (P 145). Brewed green tea, leveled up with Calamansi and iced. 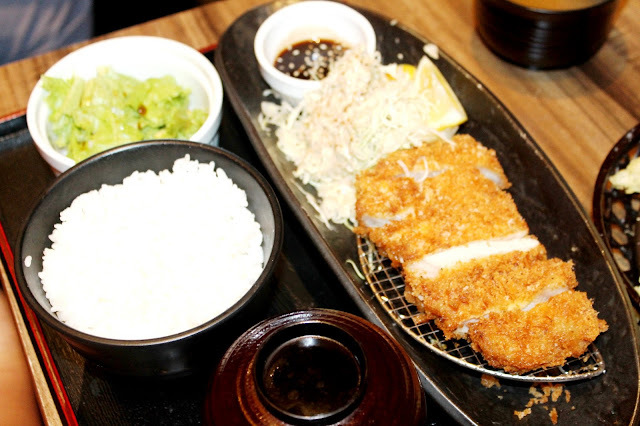 Other customer favorites on the set includes Deep Fried Pork Cutlet Set (P 395). The tender meat crusted and served with cold soba salad will sure capture every voracious pork eater. If pork is not on your choice, you can opt to have the chicken. You will be surprised to find that the menu is not that strictly pure Japanese. There are salads, barbecues, pizza and some pasta, but infused with Japanese style. 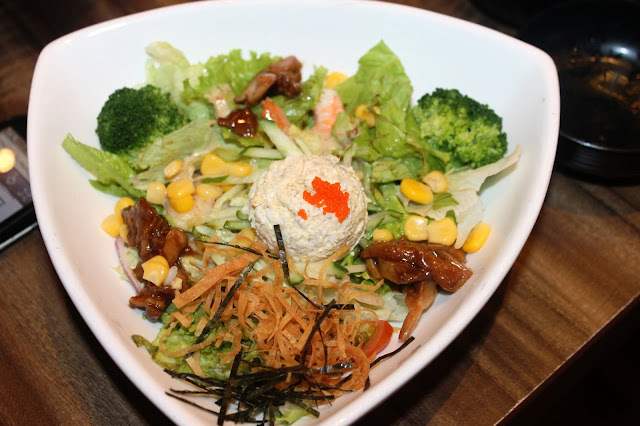 How about a salad bowl with a combination of lettuce, broccoli, onion, corn, cherry tomato, shrimp, broccoli tossed in sesame ponzu dressing? Ponzu dressing is a variation of a Japanese dipping sauce. 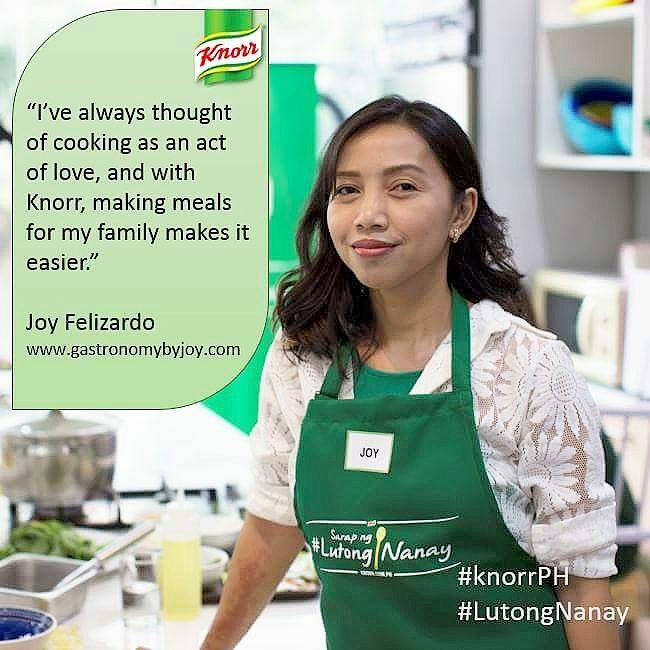 It's basically a three ingredient recipe: Light soy, lemon and rice wine vinegar, which according to Ms. Lia Cabral (one of the Marketing Manager of The Bistro Group) is imported from Japan. Beef Spring Onion Roll Skewer (P 175) really had me eating not just a stick. It's tender beef slices in sukiyaki marinate and uniformly sliced spring onions all rolled with bacon. This is a true crowd-pleaser, together with the other dishes below. Chicken Thigh Skewers (P 105). This tendered chicken bits can be enjoyed as it is or with rice. Fresh slices of Scallop Sashimi (P 395). Assorted Salmon Sushi and Sashimi (P 295.00). Chawanmushi or Japanese steamed egg custard. One of the best way to enjoy the texture of eggs at the most tendermost and silkiest. It has the sweetest aroma I have ever tasted in eggs using the least ingredients. Pure Japanese simplicity at its best. Another beverage I need to go back to is the Mango Snow Mountain (P 165.00) and a lot more signature drinks. Dessert is not to be missed here. 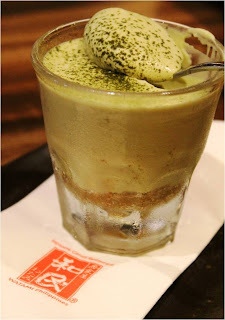 For maccha/ matcha lovers you can choose form Maccha Ice Cream and Anmitsu Dumpling (P 175.00), Maccha Parfait (P 195.00) and Maccha Tiramisu (P 155.00) which was what I had before leaving a place which exudes ishokuya —a balance of the elements of good food, great ambiance and good service that can bring people together. Watami has over 700 restaurants in Asia and has branches in Glorietta 1 and at Mall of Asia, with more to open within the year. The restaurant is part of The Bistro Group, a collection of international hospitality casual dining brands and home-grown restaurant concepts, namely TGI Friday's, Italianni's, Fish & Co., Flapjacks, Pig Out!, Krazy Garlik, The Stock Market, Bulgogi Brothers, Ma Maison, Village Tavern, and Modern Shanghai. Hmm Watami... I must not miss this next time I crave for Japanese food. 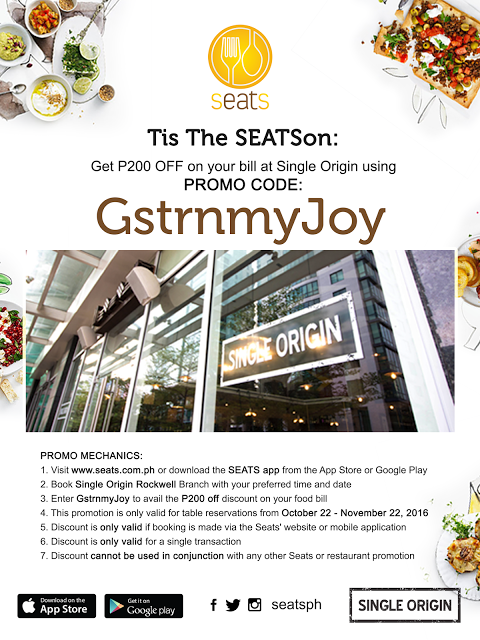 How could we miss this resto? we visited MOA way back in March and haven't notice this one. We're big fan of Japanese and resto and looking on your photo made us salivate. Yum. 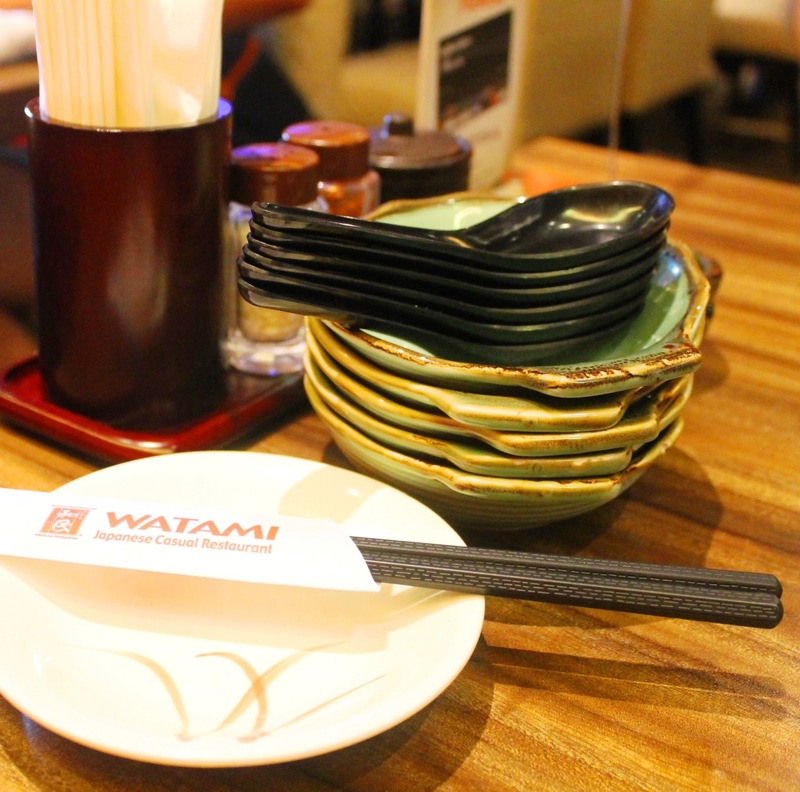 I really like the food at Watami, although service at their MOA branch back then, was so slow. I haven't visited yet after that, but reading your post and looking at the photos made me crave! wow, looks yummy. The place also looks neat and relaxing. Turn the gps back on as well as let it run through. Other high-quality Tapco brake brands are actually the PRO 13 and the "Windy" SP series. I love japanese cuisine. Good thing, they have a branch in Glorietta. Nice!. Will include this on my to-go list. Roasted Mackerel Rice Set is my favorite coz I am not into fresh fish. Here is another good place to go for a food trip. The price is unbeatable and everything is serve fresh. SUSHI and TEMPURA are my fave Japanese dish.